The need for blood is constant. Your contribution is very important to maintain a healthy and plentiful blood supply. Your donation helps save lives by giving of yourself in just about an hour. You may never meet the person who receives your blood, but you should feel good knowing you helped change a life. The Clinton Community Blood Drive is cosponsored by the Clinton Alliance Church, the Clinton Community Library, and the West Clinton Fire Department. The blood drive is held in the Alliance Church’s Youth Center. 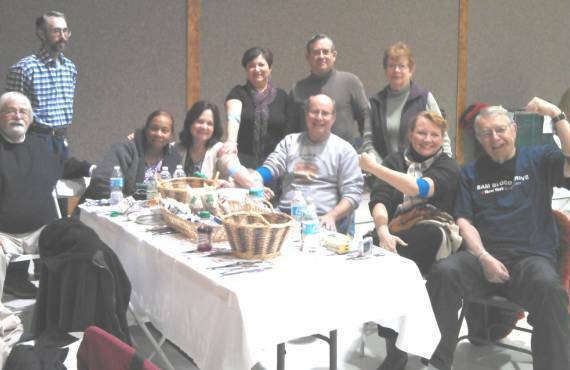 Donors, helpers, and blood service workers at the end of the day with some showing their bandages around their arms from donating at the Clinton Community Blood Drive. Seated (L to R) Tom and Bonnie Lint, Linda and Brian Mortensen, Claudia Cooley, and Ray Joyce. Standing Dave Graybill, Joan and Bob Tompkins, and Barbara Joyce.